I don’t know what to say about this stupid Gilette ad that came out about a month ago. Who cares? The meme community has been busy including the data science community. See the image below. It makes you wonder how silly you must be to think you can be you could do real’ data science’ or ‘machine learning’ without understanding the underlying math. You would be surprised how many really are out there who think this way. I just wanted to let you know that my next to do will be setting up the track record section on QuantLabs.net. This will be a big deal to showcase the power of this cypto currency strategy. It also shows it takes confident to shows it results daily. Many other trading ‘gurus’ are not equipped to do that since they market but less trade sucessfully. If they did, we would see their track record front and center on their websites. I will let you know when this gets posted. As said, I am now taking crypto currency payments for future services. I just find it much more convenient with less third party snooping and transaction fees. As an extra incentive, I will offer steep discounts for this type of payment. It also helps fund my Binance account for better crypto currency trading. Just remember as this Python Infrastructure Building Block course live component comes to an end, I will jacking up the price… a lot! As said though, I will keep the crypto currency prices current. Smart huh ? This entry was posted in Quant Analytics and tagged Data Science, Machine Learning, math on February 11, 2019 by caustic. If you know me, I have spent quite a bit of time with Khan Academy. I found it the best resource to learn about any form of math. As the behind the scenes of math is important for any data science, machine learning, and artificial intelligence. I am dumbfounded some think it is ok it be a data analyst with out understand the math behind the routines they use. I call that the blind leading the blind. One can apply this logic to crypto currency pairs as I do in my current analysis. Also, I still find this guy one of the of the best online resources to learn general Machine Learning when it comes to Python programming. If you are concerned about pricing, I just posted the the more affordable but older Python 2 Infrastructure course without the Crypto currency. This entry was posted in Bitcoin Crypto Currency, Premium Membership, Quant Development and tagged crypto currency pairs, Data Science, Probabilit, series, Statistics on August 1, 2018 by caustic. How Much Math Does an IT Engineer Need to Learn for Data Science? This entry was posted in Quant Analytics and tagged Data Science, engineer, IT, learn, math on December 23, 2017 by caustic. (This will be the event the year! 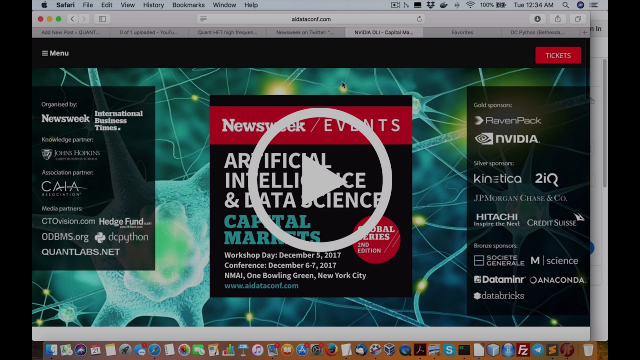 This entry was posted in Quant Job, Quant Opinion and tagged 20% DISCOUNT, AI, capital markets, Data Science, Newsweek, NYC, this we on December 3, 2017 by caustic. It seems that yesterday started out in a whirlwind. At 10 AM EDT, an official Tweet went out on Newsweek’s official Twitter account of 3.3 million followers announcing their upcoming event in New York starting Dec 5-7. It is quite the event entitled “Newsweek Artificial Intelligence and Data Science in the Capital Markets.” It has a variety of big names from asset management companies ranging from Sigma Two to Blackrock to Goldman Sachs. Holy! You really need to be there if you want to learn about the latest in this field. I put together a 15 minute video to detail what will be included over the 3 days. Did I mention that we are one of the sponsoring media partners for this huge event?? >>> Interested? Join here before it is too late. Well, being recongnized for that, I guess set a pre-sale deadline of this THURSAY (as in 2 days!) before the official Black Friday/Cyber Money hits this weekend!! That mean you can expect a 50% increase come this Friday Nov 24!! After Monday, there will be another price increase as in doubling the rate come Tues It could go up from there if the this strategy works out in the long run. More details to follow in a few days on that. As you know, time starts ticking. Tick tock. This deal will vanish permanently! This entry was posted in Hedge Fund, HFT High Frequency Trading and tagged AI, Conference, Data Science, Heavy industry, hedge fund, HFT, Newsweek, NYC, players on November 21, 2017 by caustic. Whoa! There are so many industry institutional players at this conference !! This happens at NIAC in NYC Dec 5-7!! This entry was posted in HFT High Frequency Trading, Quant Job, Quant Opinion and tagged AI, Conference, Data Science, Heavy industry, hedge fund, HFT, investment bank, Newsweek, NYC, players on November 21, 2017 by caustic. This entry was posted in Uncategorized and tagged containers, Data Science, Docker, Google, Machine Learning, Python, TensorFlow, Trying on November 20, 2017 by caustic. Here is a popular data science book found on my Facebook feed. It was quite free with the ability to learn all the necessary packages to get you started in learning data science. Just for your info, Python is now the most popular programming language to learn and implement machine learning with. This means it is an excellent choice to advance your career! This book does cover an old machine learning package called Scikit-learn but it still popular for learning purposes. As promised, I have made some great leeway on this automated forex trading strategy over the last 24 hours. If you want to get a preview on the visualization part, you can check out the first draft video here. As I hope to test this strategy within Dukascopy JForex in coming weeks, I am obviously hoping this works with great success. If so expect my Quant Analyticsand Quant Elite prices to shoot up in coming weeks as I will now have extra credibility to do just that..
Join my ultra cheap Quant ELITE membership here. This entry was posted in Premium Membership, Quant Books, Quant Development, Quant Opinion and tagged Data Science, free, Handbook, Intro, Python on November 15, 2017 by caustic. This entry was posted in Quant Books, Quant Development, Uncategorized and tagged Data Science, free, Handbook, Intro, Python on November 15, 2017 by caustic.